They say that the devil is in the details, which is a good way to describe the complications expected to surface with the Full Moon on Thursday, March 8. This event occurs with the Moon in analytical Virgo opposite the Sun in impressionistic Pisces, challenging us to find connections between facts and faith. The solar swing through the sign of the Fishes ends the astrological year by dissolving ego boundaries and reminding us of the larger spiritual community to which we all belong. Pisces is the limitless land of dreams where we bathe in compassion, are enriched by imagination, and allow ourselves to go with the flow. The conscious qualities of the Pisces Sun, though, are opposed by the emotional instincts of the Moon in Virgo, a pragmatic Earth sign more concerned with concrete reality than idealism or escapism. We may feel constrained by self-doubt with this lunar placement that brings our attention to flaws that need fixing. We tend to worry about what we've done wrong or what might go wrong instead of trusting in the benevolence of the universe. 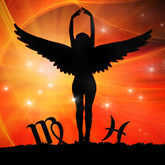 Virgo reminds us to master details, eliminate distractions and concentrate on taking care of business. Each Full Moon is a time of potential crisis as we encounter extremes within ourselves and in our environment. The placid Piscean faith in the unknown is challenged by the concrete issues we're facing right now. We may vacillate between high hopes and petty criticisms, sometimes overlooking critical information and other times obsessing over minor matters. A key to successfully navigating these waters is to recognize when to drill down and tackle tough tasks and when to let go and trust in an outcome that you can't control. Developing the technical skills needed to be more useful to others or to support creative interests is a healthy way to use the Virgo Moon. A more precise description of feelings can also prove beneficial by linking cause with effect, which can help to untangle emotional knots. Forgiving yourself and others is the Pisces Sun's contribution to this story, as is recognizing that no one is an island. If we lack support and seem to be alone in our struggles, setting aside the limits imposed by logic and diving into a sea of belief in something larger than ourselves will salve the wounds of isolation and reconnect us with the divine.